ecause the President must carry out so many important and demanding responsibilities as the leader of our country, he relies on his Chief of Staff to ensure that the White House Office runs effectively and efficiently. 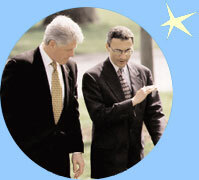 The Chief of Staff position was created relatively recently; records show that the first Chief of Staff, Sherman Adams, began his service in 1953, during the Administration of President Dwight D. Eisenhower. 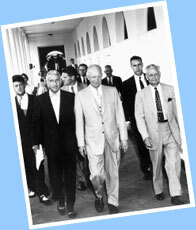 President Eisenhower (center) walks with his Chief of Staff, Sherman Adams (far right).